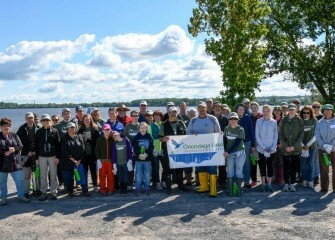 June 2017 - Thirty-eight community members with the Onondaga Lake Conservation Corps took part in habitat restoration along the southwest shoreline on a Saturday morning. 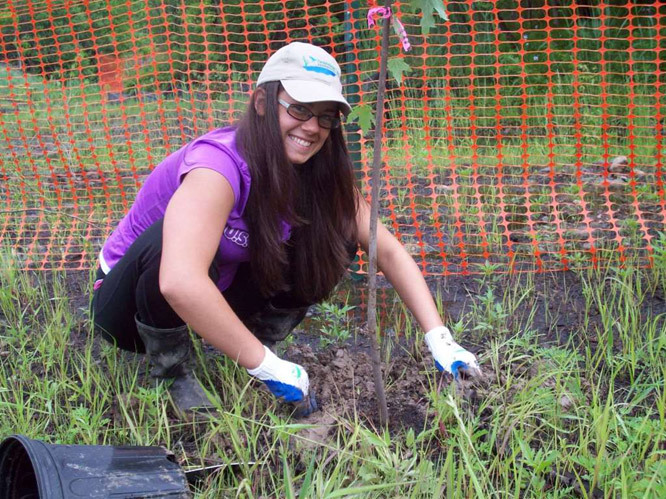 June 2017 - An environmental engineer with Parsons, Natalia Cagide-Elmer, explains proper planting procedures and goals for the day. 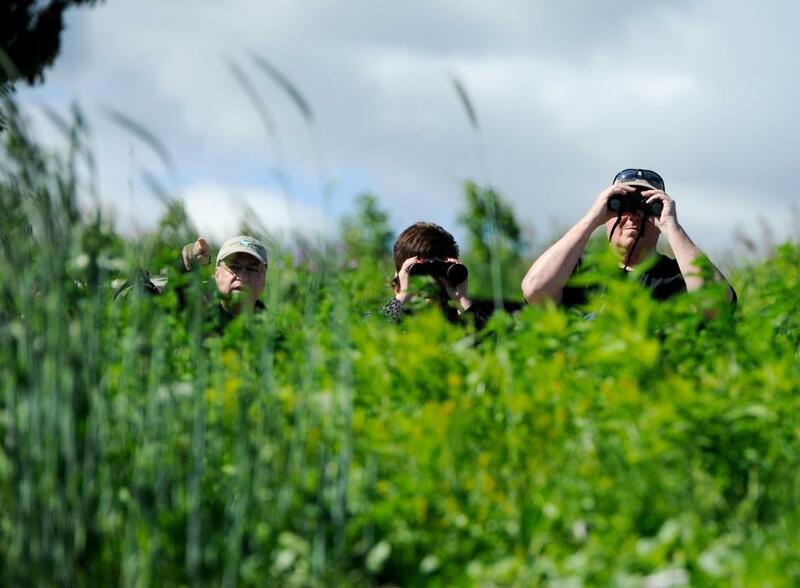 June 2017 - A group heads out to record bird species in the area. 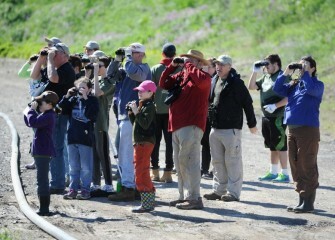 With guidance from Onondaga Audubon Society, Corps volunteers identified 29 unique bird species. 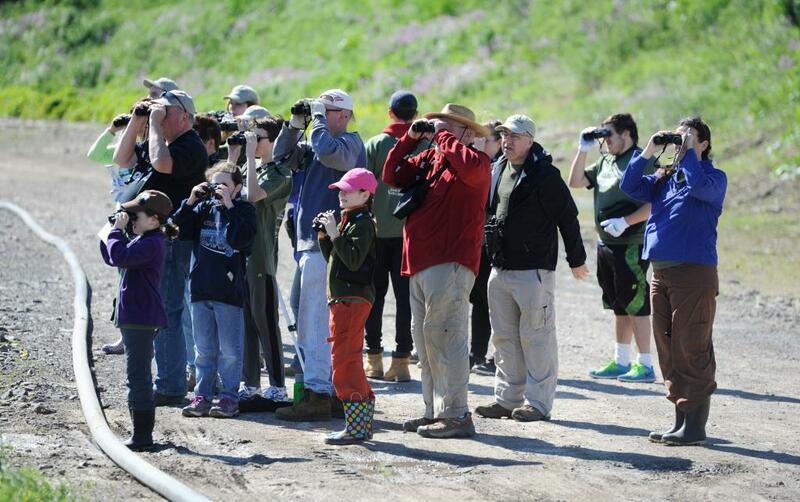 Many notable species were sighted including Chimney Swift, Veery, and Osprey. 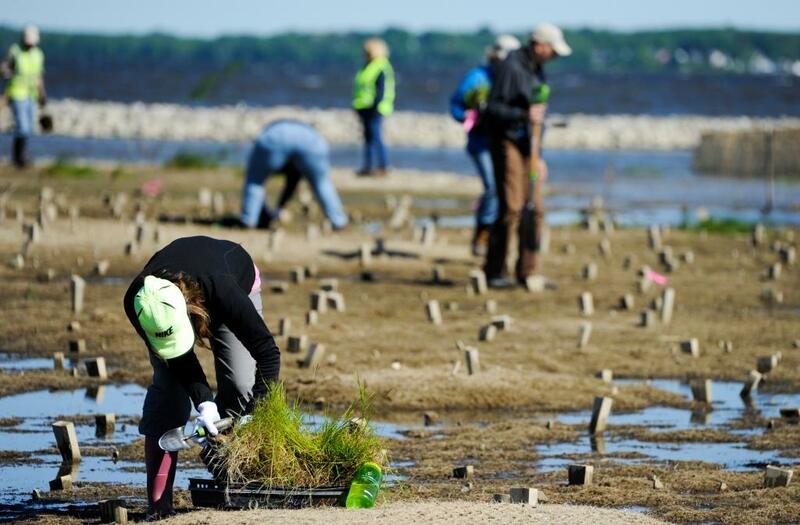 June 2017 - First-time Corps volunteer Ellen DuPree (foreground), of Fayetteville, separates individual fowl mannagrass plugs from a tray. 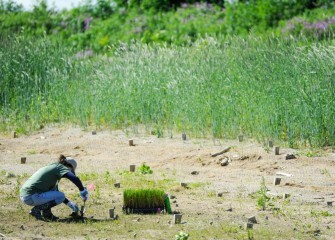 June 2017 - Native species planted include a mix of wetland plants suitable for supporting a wide diversity of wildlife. 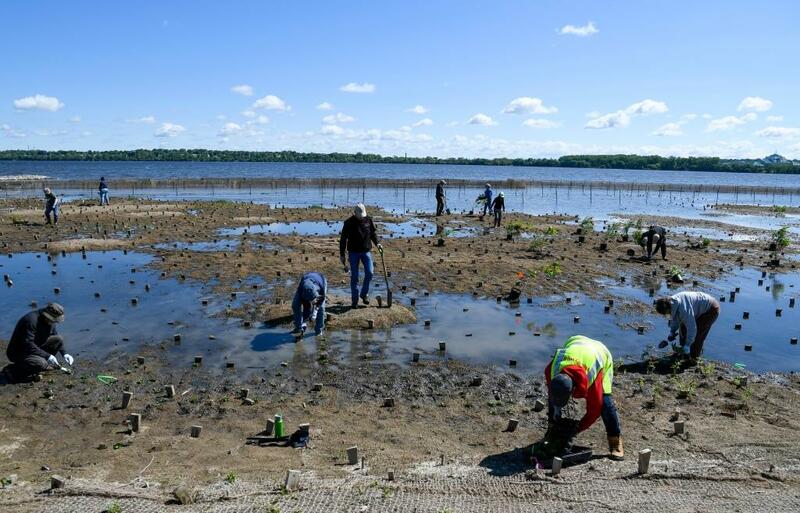 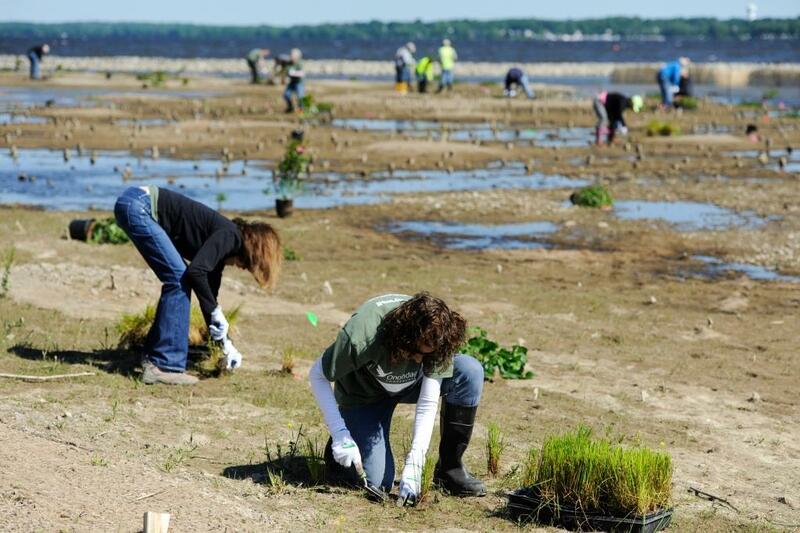 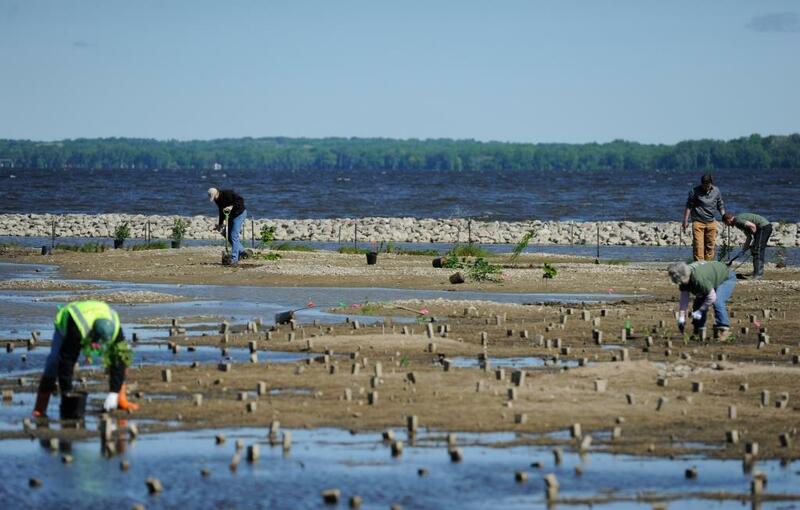 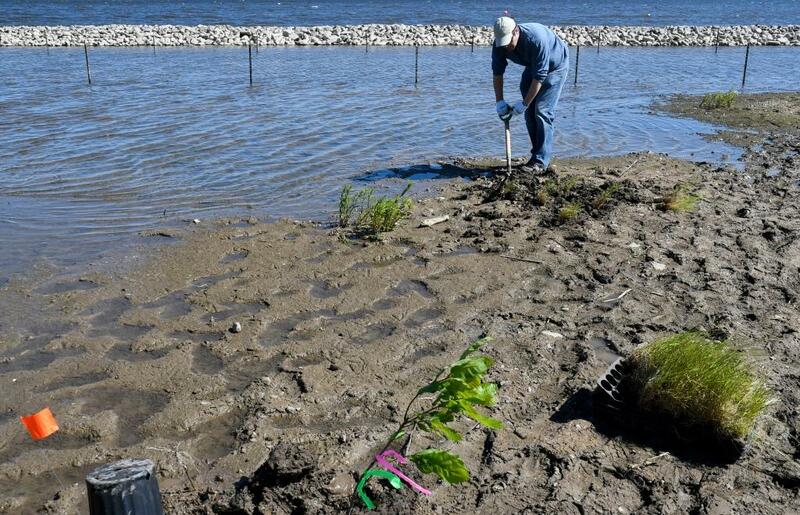 June 2017 - Volunteers install approximately 700 herbaceous plants and 240 native trees and shrubs along the southwest shoreline of Onondaga Lake on a Saturday morning. 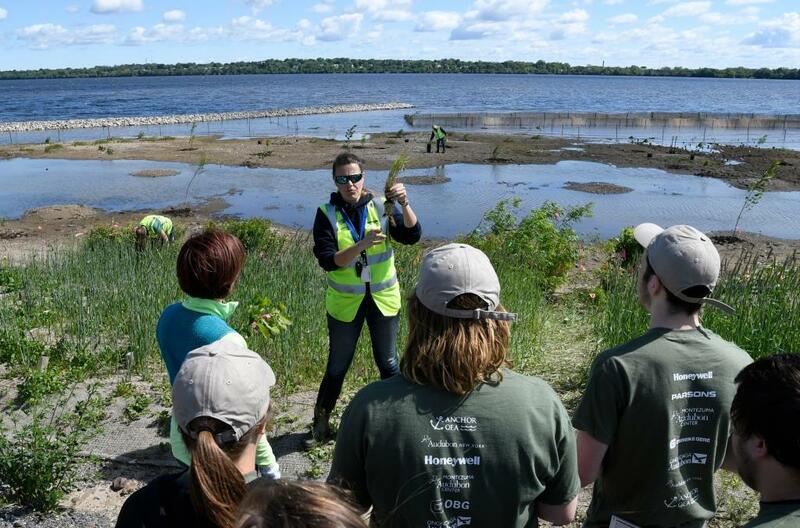 June 2017 - Cobble berms (background) were built in 2016 to reduce wave action along the shoreline, and establish calmer water areas suitable for wetland plants and associated wildlife. 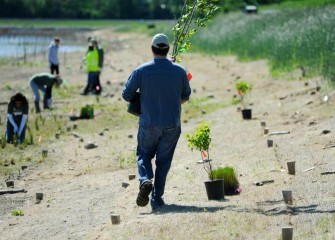 June 2017 - Todd Sealy, of Syracuse, carries an American sycamore tree along the Southwest Lakeshore to a suitable spot. 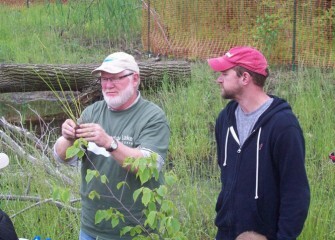 The native American sycamore is often found near rivers and other water sources, and is tolerant to occasional flooding. 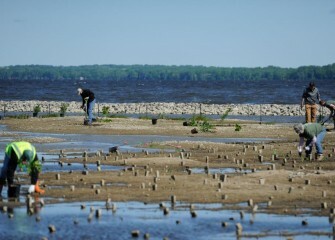 June 2017 - A cardinalflower is planted in a flooded area along the shoreline. 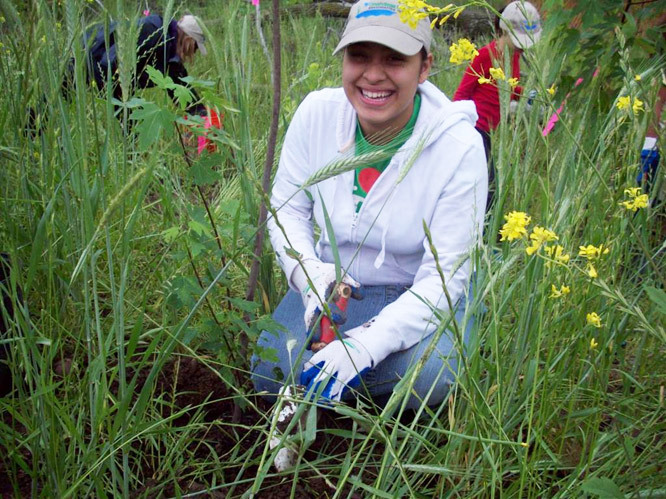 Cardinalflower produces bright red blooms late summer through early fall. 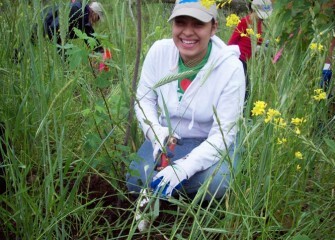 Once established, the plant will multiply and fill out the area around it. 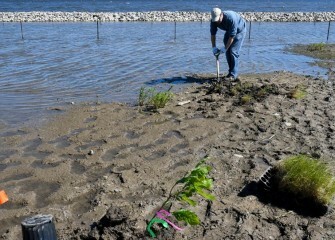 June 2017 - Volunteer Mark Wesel, of North Syracuse, plants a winterberry bush near the water’s edge. 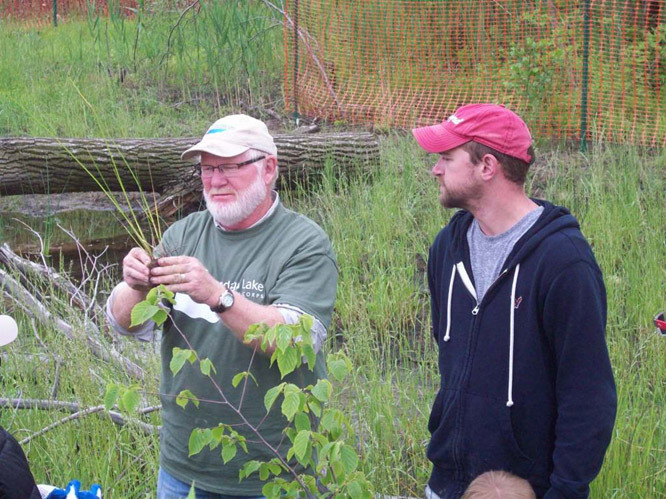 Winterberry can provide cover for small animals, nectar for insects, and berries for birds. 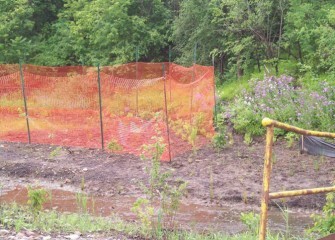 June 2017 - Between the shoreline and a berm, an area in the water is fenced off to protect young wetland plants to be installed over the next few weeks. 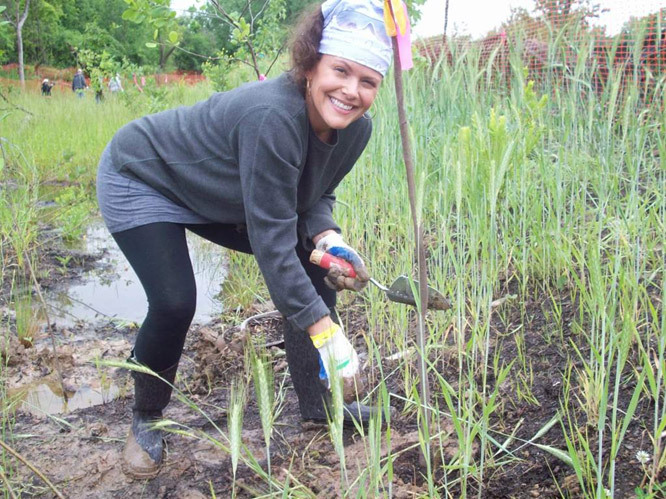 June 2017 - A variety of native plants including boneset and speckled alder are planted to create a rich diverse habitat along the Southwest Lakeshore. 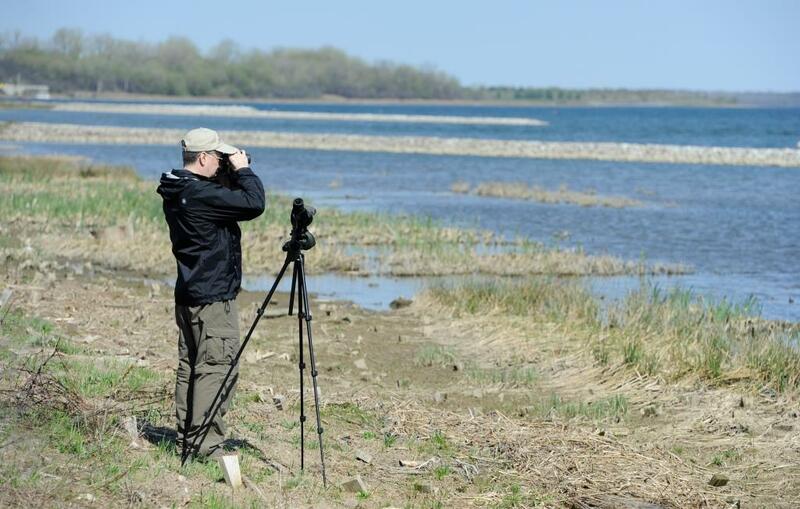 June 2017 - Paul Marconi (right), a member of the Onondaga Lake Conservation Corps since 2012, spots birds with Onondaga Audubon volunteers Paul Richardson (left) and Michele Neligan. 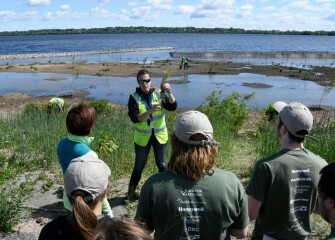 June 2013 - Volunteers from Bryant & Stratton College work with the Onondaga Lake Conservation Corps to inspire future stewards of Onondaga Lake and its watershed through a hands-on, experience-based program. 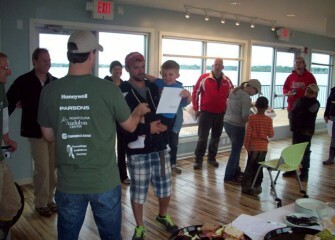 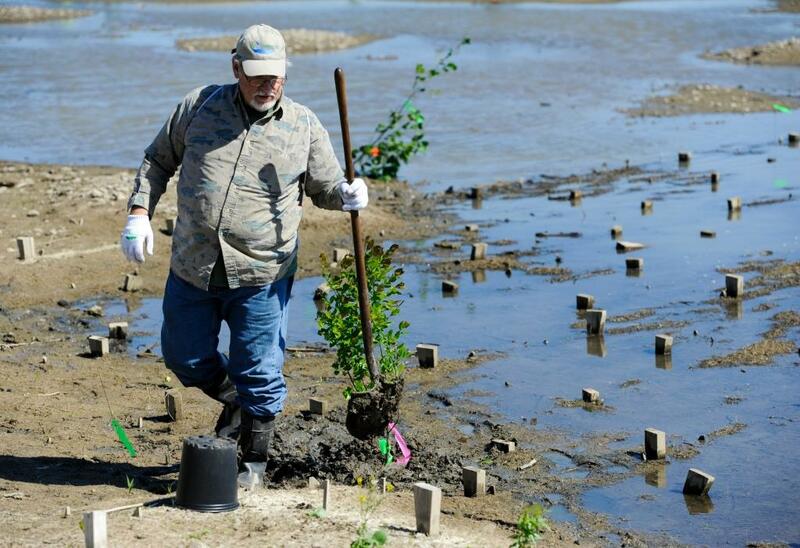 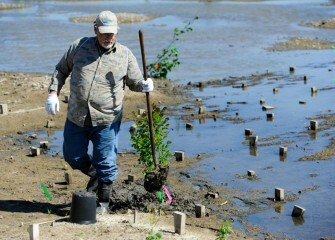 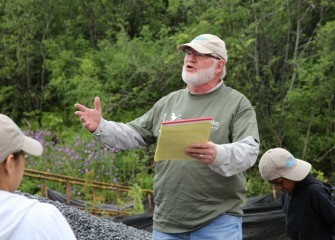 June 2013 - At Harbor Brook, wetland expert Joe McMullen, provides volunteers with an overview of the planting activities. 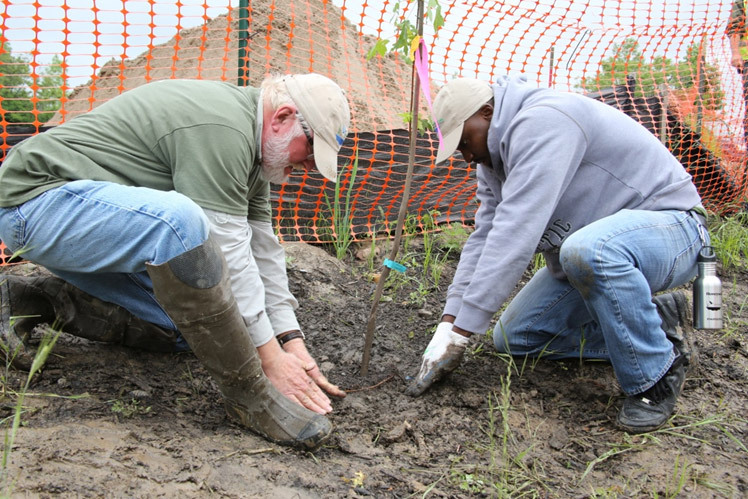 June 2013 - Tony Eallonardo, Ph.D., project scientist at O’Brien & Gere, shows Bryant & Stratton College volunteers how to remove plants from pots and prepare the roots. 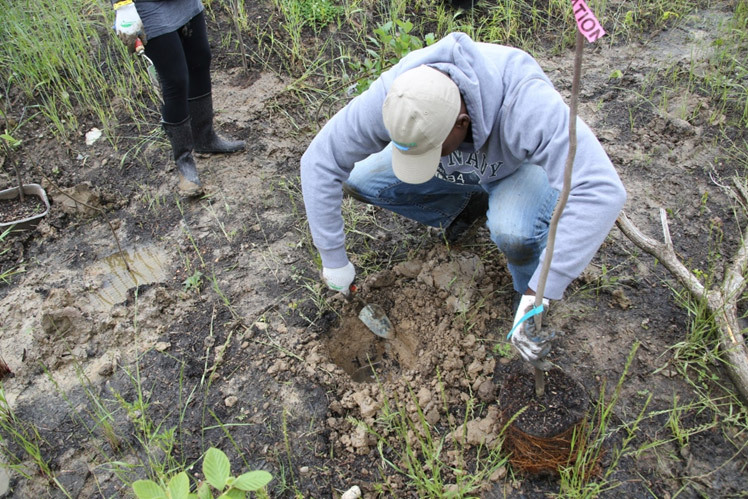 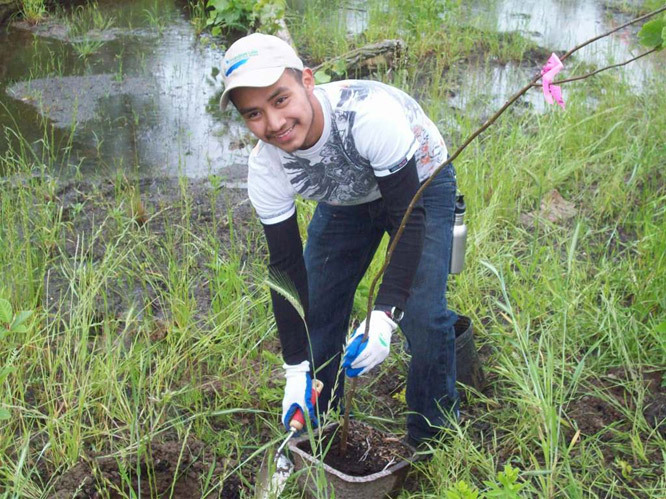 June 2013 - A student digs a hole deep enough to hold the tree’s root ball. 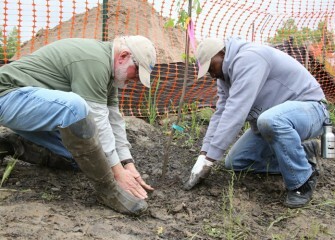 June 2013 - Roots of trees are roughened before planting. 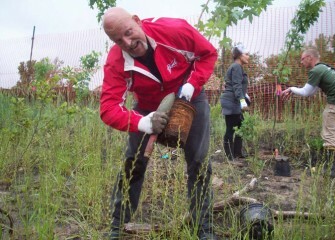 June 2013 - After putting a tree into the ground, soil is packed firmly around the tree. 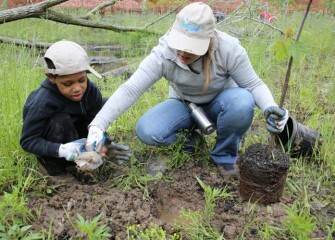 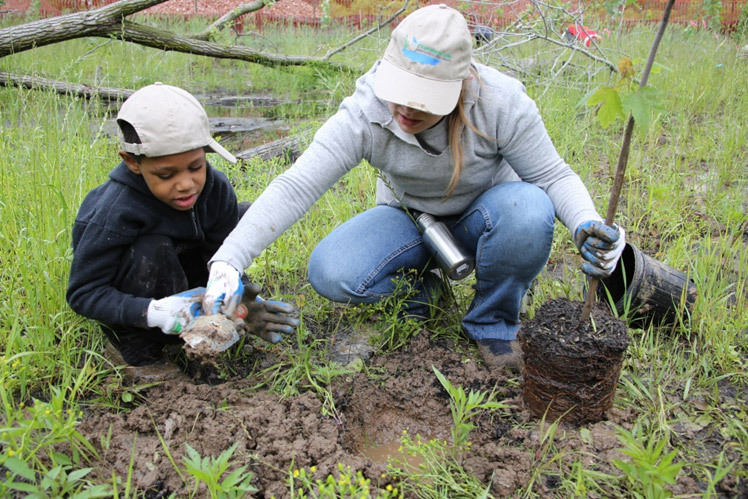 June 2013 - Students enjoy planting together with family members at Harbor Brook. 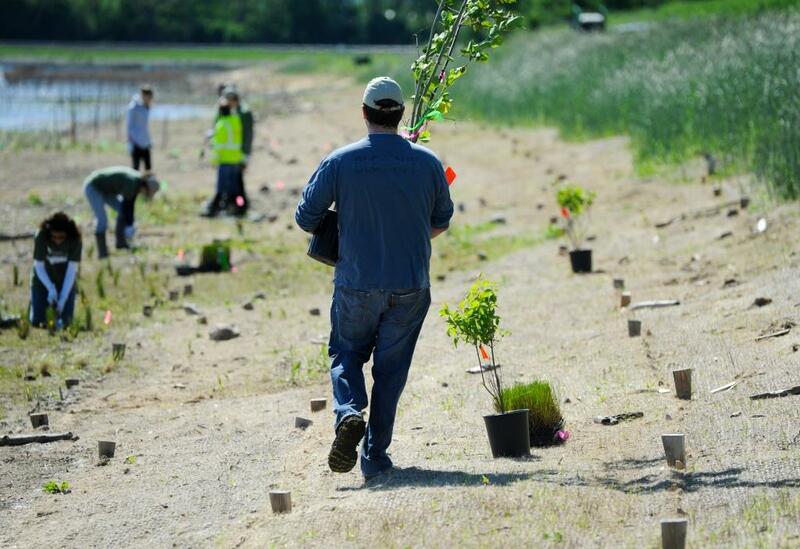 June 2013 - Native species will help re-establish habitat at Harbor Brook that was once dominated by invasive species. 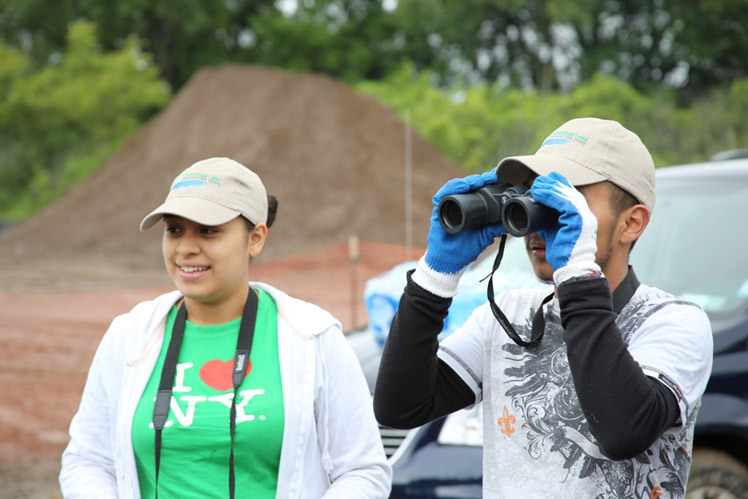 June 2013 - Volunteers also spot and record birds in the area. 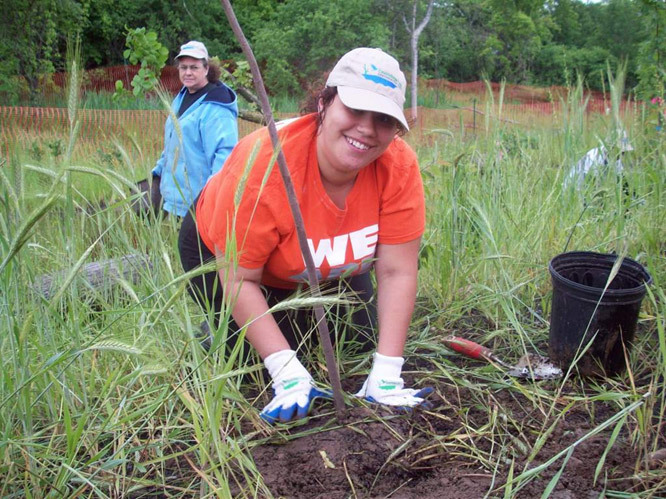 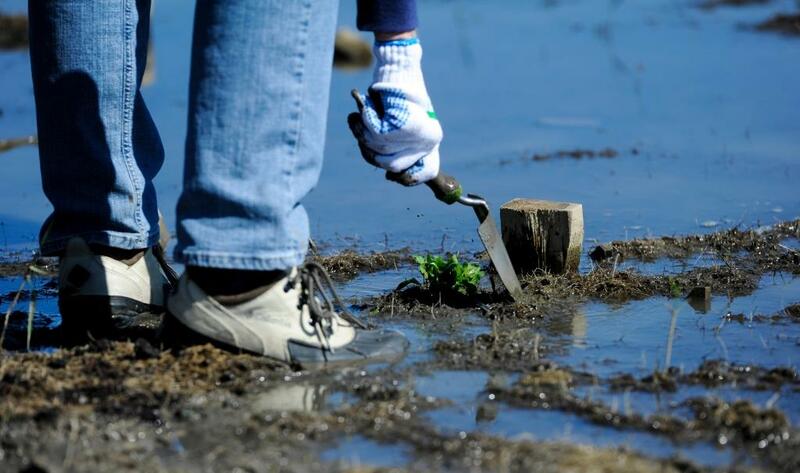 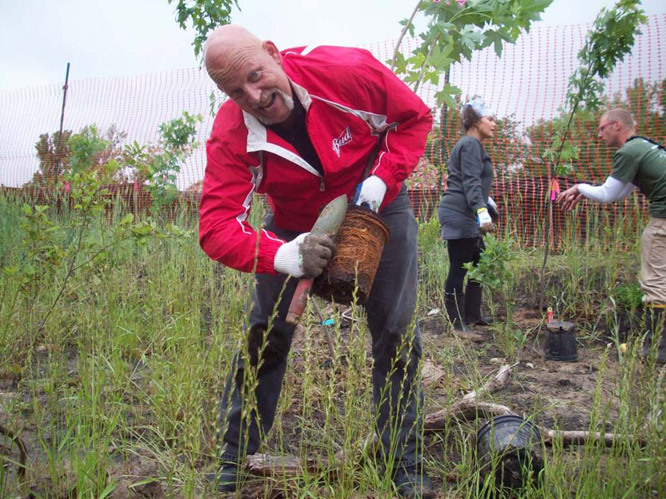 June 2013 - Volunteer efforts at Harbor Brook will contribute to the transformation of 2.5 acres of wetlands into a healthy new habitat. June 2013 - Joe McMullen shows the correct way to prepare a grass plug for planting. 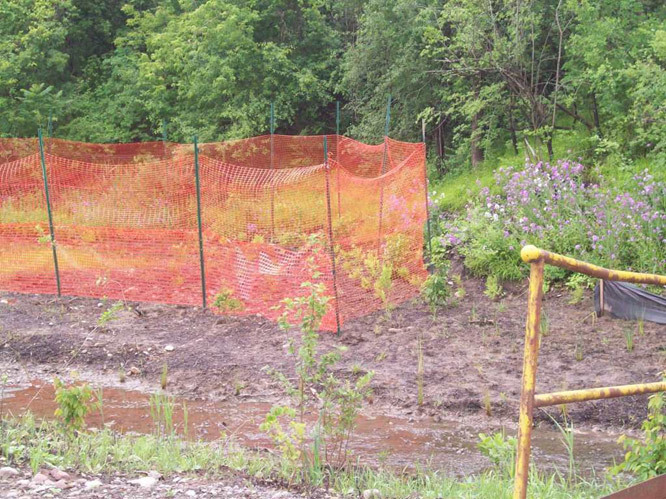 June 2013 - Temporary fencing is installed to protect young plants from deer and other animals. 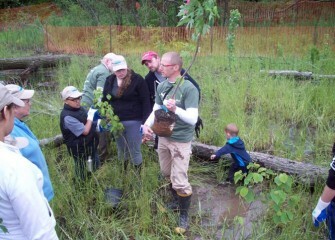 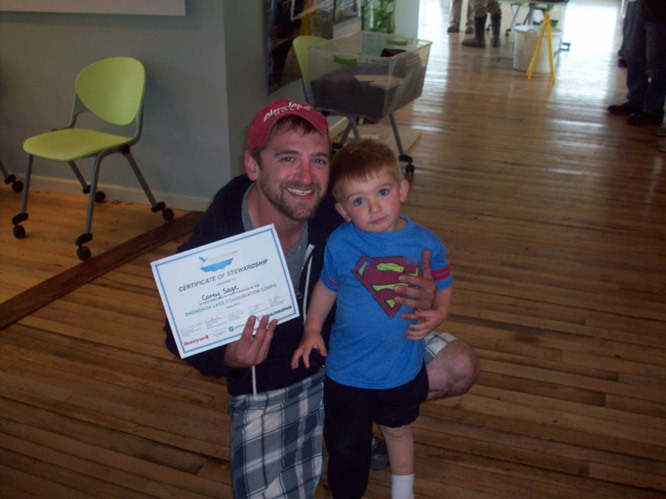 June 2013 - Bryant & Stratton family members don’t mind getting a little wet while becoming environmental stewards. 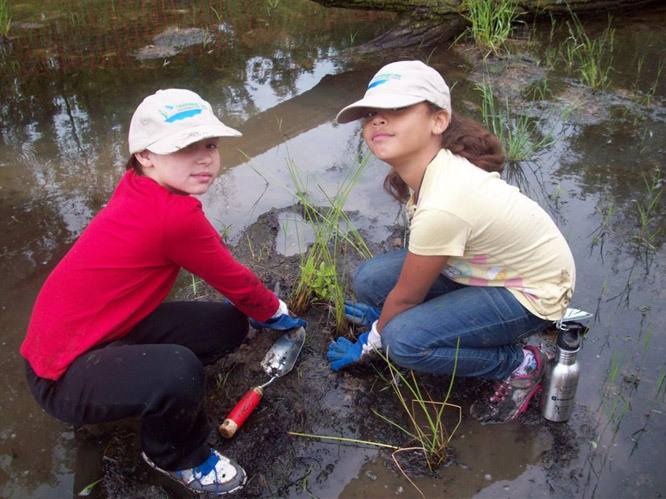 June 2013 - By re-establishing wetlands and improving habitat, the Harbor Brook project will help create a healthy Onondaga Lake watershed. 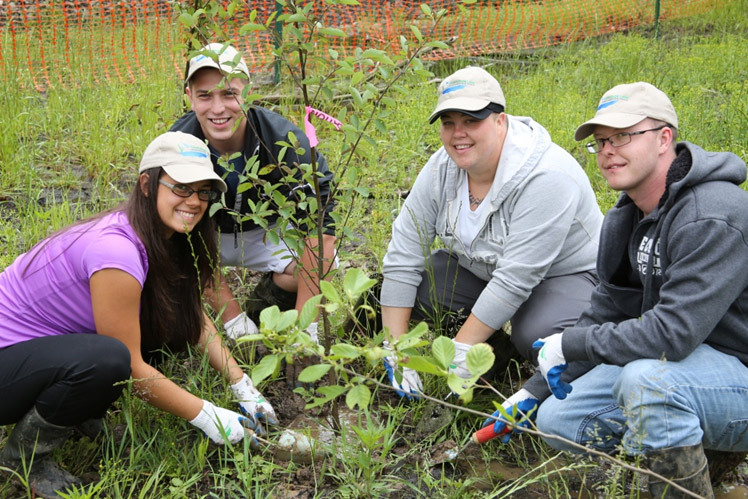 June 2013 - The Onondaga Lake Conservation Corps has held six events since it was founded in 2012. 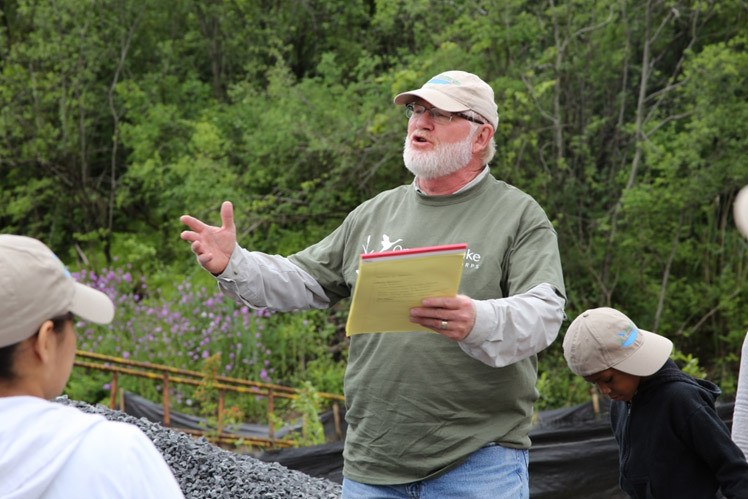 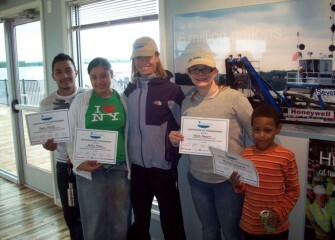 June 2013 - Volunteers receive Onondaga Lake Conservation Corps certificates from Frank Moses, director of Montezuma Audubon Center. June 2013 - Conservation Corps certificates recognize volunteers’ contributions toward stewardship of Onondaga Lake and its watershed. June 2013 - Kelly Schalk, Ph.D. (center), professor of Ecology at Bryant & Stratton College, with students and family members. 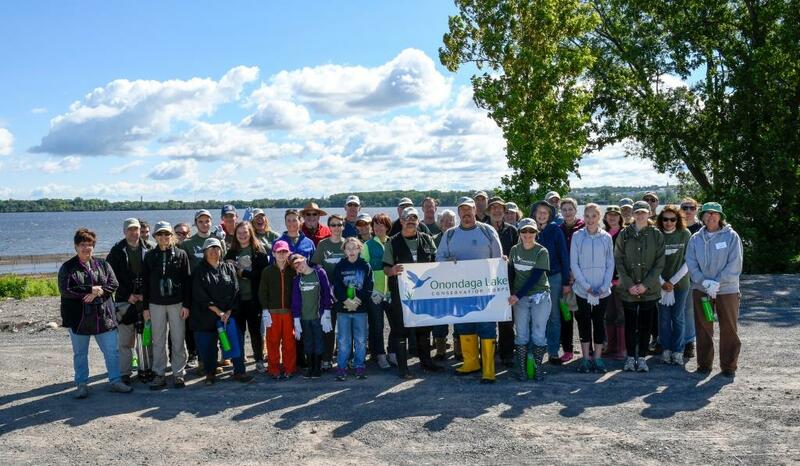 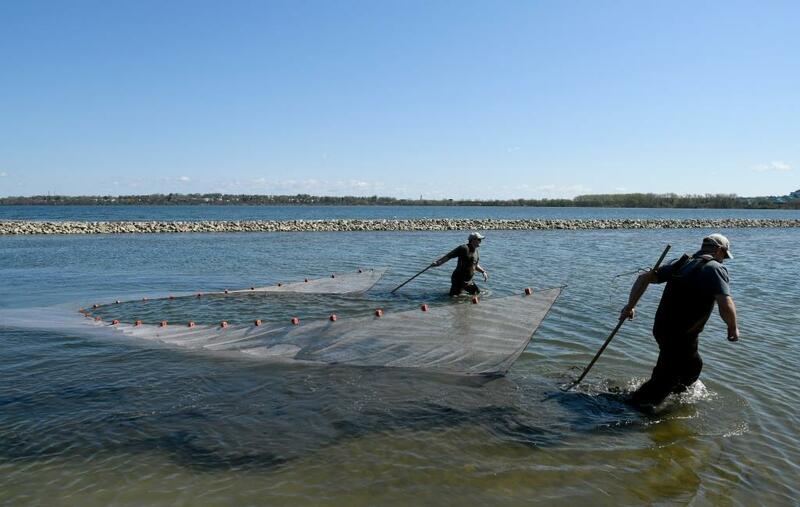 June 2013 - Since formation of the Onondaga Lake Conservation Corps, hundreds of volunteers have become environmental stewards and Corps members.